It's me again! Sorry I accidentally took like a month off from blogging but honestly with finals and then Christmas coming up it really felt like I only took 2 days off! But I know that right now is the hardest time of the year to be a 1L. You took your finals that were probably harder than you anticipated and now you just sit back and wait for your grades. I remember coming home from my first semester of law school and family friends would ask me how school was and my honest answer would be, "I don't know. I could've flunked out or I could be on the Dean's list so we'll find out once grades are posted." And it takes like a month for your grades to be posted! It's so nerve-wrecking because for almost all of your classes, your grade comes down to that one test. None of this oh if I make an 83 I'll get an A in this class math because you don't have any other grades to calculate and because of the curve, you don't know what you'll get in the class. I feel like the curve can be a major source of anxiety for anyone who isn't used to it, so I thought I'd dedicate a whole post to it since I've just mentioned it in passing before. The curve was explained to me once as You don't have to outrun the bear, Just the other campers. This is the curve at it's most basic part, but isn't really the whole truth. I mean, yes, technically, if you do better than everyone else, you'll get a good grade. And yes, technically, this didn't really happen in college because if everyone else did just as good as you, then you'd all get a good grade. But here's the thing I've come to find out, the curve doesn't punish you like you'd think it would. In all actuality, law school is generally made up of some of some really smart people to begin with. The curve can show you who really understood the material (beyond just word vomit) and who really worked for it. The people who get A's actually do write a really great answer and the people who get F's actually do write a really blah answer. And the people who get B's/C's (whatever the curve median is set to) actually do write really average answers. Dan punched Paul. Discuss the potential outcome of a lawsuit between D and P.
F answer: Paul can't sue Dan because it's totally legal to punch people. D answer: Paul will win. F completely gets the answer wrong. D just barely answers the question. C answers the question and gives a rule and some elements. B does that plus applies the facts of the case. See, up to this point, all answers that were right technically passed. A just goes that extra step and shows that they truly do understand and know everything they've learned about battery. There's nothing wrong with B but between the two responses, it's obvious who deserves an A. And there's nothing wrong with C but between the two responses, it's obvious who deserves a B. Law school doesn't just hand out 4.0's; you have to really work hard to earn them. I say this because it can be really easy to either be completely afraid of the curve or blame it for your grade. But just like in my example, it's usually pretty obvious who deserves the F and who deserves the A so it's not like people aren't getting the grades that they deserve. And actually, the curve can really help you. For example, in undergrad if there was a really hard test and most of the students got like 30-50% wrong, then they'd all fail. But in law school, if a test is really hard and most of the students got that, well then what do you know getting 50% correct is a C! That's right, sometimes the curve can pull you up! 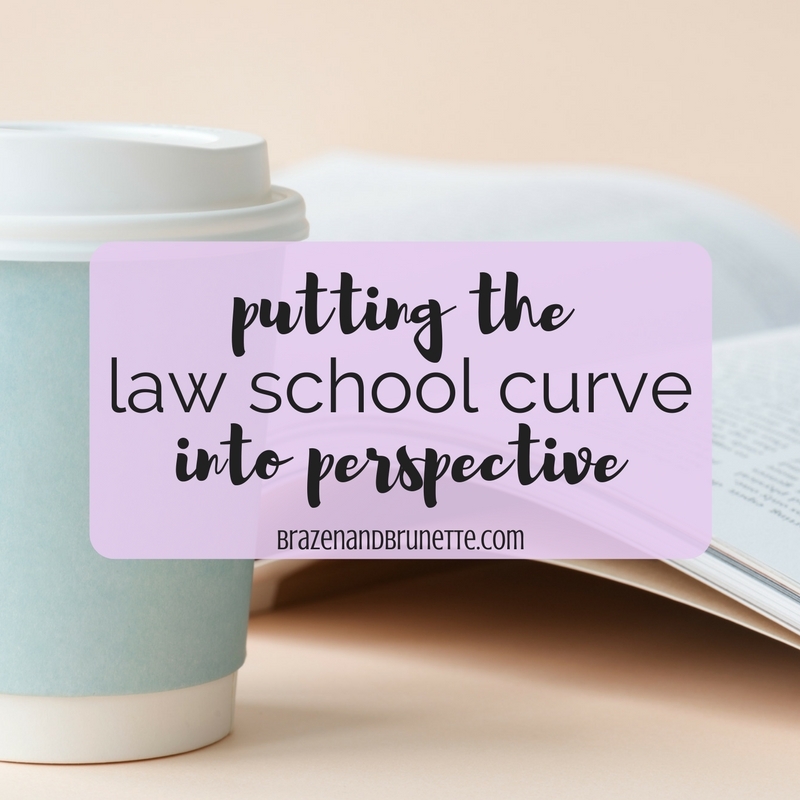 Here's another glimmer of hope about the curve: it gets easier after your 1L year (but also double check with your school before you rely on this). A lot of schools see the 1L year as a way to test out the class. Some people are only in law school because it was there backup plan (yes this is a strange concept to those of us who dreamed of only this for years). Some people are only in it because they were pressured by their parents to be a lawyer. Some only are here because they just want to be rich. Law school will test you to see who really will dedicate their time and effort to it and who will ultimately need to be weeded out because they just don't need to be a lawyer. And future interests in property are a way to haze you just for fun! Back to my point, once you survive to be a 2L and your school knows you're in it to win it, they don't have to test you as hard. This means that hopefully your GPA will go up just a smidgen. So, how do you beat the curve? The easiest way is to point chase, my friends. In the spring when you get your grades back, go to office hours and review all of your finals! While you're there, hopefully your professor will offer to let you see the best responses to each question. If he doesn't offer, ask to see it! If they don't allow this, then ask them to go over your final with you and see where you can improve. Usually really all you need is to just explain yourself just a little bit more! The secret key to point chasing is attack outlines! Condense all of the material from each chapter down to the main topics that you can fit on one page. So for this, I would have battery, the elements, and a relevant case name if there's one. If it's a closed-book final, memorize this and then write it down on scrap paper during the first minute of your test. This way, you have a little checklist of everything relevant to include on any one issue so that you can make sure you're covering your basis. Another tip is to use your time wisely. If you read a fact pattern and realize that you don't really see any issues, skip that question and move on. It's better to spend your time answering questions that you truly know the answer for and get all the points on that one than to waste your time thinking shitshitshitshit for 20 minutes and then only having time for a half-hearted answer to the question that you do know the issues. And unless your professor specifically tells you he wants a lot of info about the cases, don't get caught in a case time-trap. Hit the cases hard and fast. For example, just say Pennoyer instead of Pennoyer v. Neff. And spend no more than one sentence stating the facts and comparing/contrasting them to your facts, and no more than one more sentence stating the rule/holding and applying that to your facts. Lots of points in just a few sentences, and then move on. But ultimately, you're not going to have peace with yourself until you accept the curve. Yes, there are people who actually have perfect 4.0's in law school (my friend is one of them and I'm amazed). However, most likely you're going to be a B/C student and there is nothing wrong with that! Reread that sentence again and again until you can accept it. It's really hard for law students to accept this statement because usually we've always being overachievers and we've just come accustomed to have stellar grades. But if you're sitting there embarrassed about your 2.5 GPA, you're worrying and stressing over nothing. If anything, take comfort that a majority of your classmates are sitting right in the same boat with you. Also, don't waste your energy being jealous of the people with better GPA's than you. As you saw above, the people getting C's and the people getting A's generally understand the material the same amount, one just did a little better job explaining how she understood the material. And I swear if I ever find out any of my readers are trying to sabotage their classmates because you're in the mindset of "the worse they do, the better I'll do," I will save what little money that I make off this blog to personally fly out to your school and yell at you. Seriously though, that mindset is what leads to "if I hide this exculpating evidence then I'll for sure get a guilty conviction" behavior. It's just a slippery slope and if that's the only way you're getting good grades then brutally and honestly you didn't deserve that grade. I'm not saying bend over backwards to help your classmates study, but I am saying that a much more realistic and sane way to approach the curve is to just put your nose down and try your hardest. Which brings me to my last point (getting off my soap box now), I said it in my podcast episode and I'll say it again: all you need to do with the curve/finals is to try your hardest and have faith that your hardest was enough. You'll pass; you'll survive; you'll move on to the next class that you think will be your law school career; and then you'll graduate. Law school is just about learning how to ride out the storm, my friends. I am 1000% at the point where I am freaking out waiting for my 1st semester grades. My friends and family keep asking me how I think I did and they don't understand how I can say "I have no idea!"